7. Cohesive lookThis terrace house may be modest in size but what it lacks in space it makes up for in style. The patchwork wall tiles in the bathroom reappear on the floor of the kitchen and hallway, and similar tones are used throughout the home. 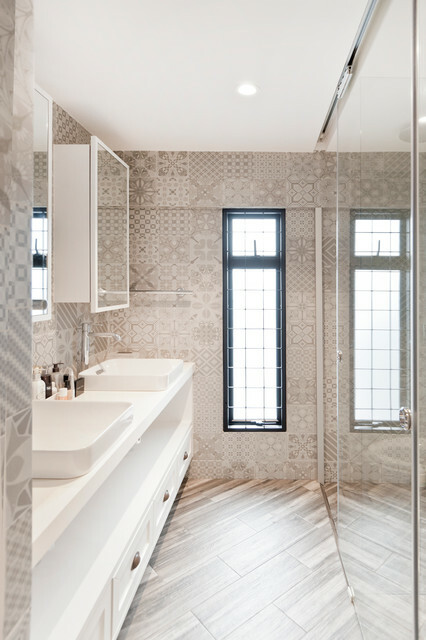 Softly monochromaticIn this bathroom, the mix-and-match tiles were selected from the same colourway, which complements the wood-grain hues of the floor, creating a monochromatic look that’s far from blah. Get the look: The muted colours on the patterned tile are stunning mixed with the pale textured floor tiles. the window, makes small space bigger!